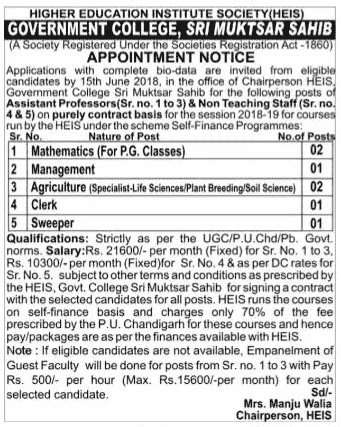 Muktsar Recruitment 2018: Higher Education Institute Society (HEIS), Government College, Sri Muktsar Sahib has given a notification of 07 Assistant Professor in Mathematics, Management, Agriculture, Clerk and Sweeper Vacancies on the contract basis. The interested candidates can apply for Govt. 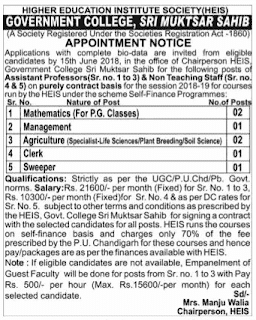 College Sri Muktsar Sahib Recruitment 2018 on or before 15 June 2018. GC Muktsar Sahib Recruitment 2018-19 notification is out. As per the Notification, there are 07 Mathematics, Management, Agriculture, Clerk and Sweeper Vacancies. The educational qualification is as per UGC/P.U Chd./Pb. Govt. norms. The age limit is as per the department norms. If you are looking for Teaching and Non-Teaching Jobs in Sri Muktsar Sahib Government College then this article is going to be very helpful for you.